Often a favorite of the San Diego long range fleets, the wahoo is found in seasonal concentrations offshore in open water and around the many banks that dot both the Baja Pacific Coast and the Sea of Cortez. Although they are targeted by the long rangers offshore, they seldom are targeted by local Baja fleets, even though they are common inshore and are often the “mystery bite” that results in a lost lure offshore. Wahoo are pelagic loners, or they can be traveling in groups of two to six fish. They can be found in tropical and subtropical waters in the Atlantic, Pacific and Indian Oceans as well as in the Caribbean and Mediterranean Seas. They grow to a maximum length of about 8-feet, but more commonly they are about 5-feet long. Scientists confirmed the maximum speed of the wahoo by measuring its bursts of swimming speed, with a result ranging from 27 to 48 mph. More IGFA records for this often-overlooked adversary come from Baja than from any other place on the planet. W-37 kg (80 lb.) 83.46 kg (184 lb. 0 oz.) Cabo San Lucas, BCS, Mexico, 29-Jul-2005, Sara Hayward. M-24 kg (50 lb.) 71.89 kg (158 lb. 8 oz.) Loreto, BCS, Mexico, 10-Jun-1996, Keith Winter. M-15 kg (30 lb.) 57.6 kg (127 lb. 0 oz.) Buena Vista, BCS, Mexico, 02-Jun-1994, Dean Ettinger, MD. Tippet M-04 kg (8 lb.) 17.19 kg (37 lb. 14 oz.) Thetis Bank, BCS, Mexico, 30-Nov-1994, Ed Rice. Tippet M-10 kg (20 lb.) 30.05 kg (66 lb. 4 oz.) Alijos Rocks, BCS, Mexico, 02-Dec-1993, Trey Combs. M-Smallfry 48.3 kg (106 lb. 8 oz.) Cabo San Lucas, BCS, Mexico, 25-Mar-2000, Anthony Santorufo. My first encounter with wahoo was aboard the Qualifier 85 with Captain Bruce Barnes in the mid-1960s. Somewhere near Thetis Bank off Magdalena Bay on what was my first-ever long-range trip, we had a jig strike. 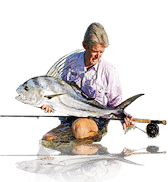 There must have been a dozen or more anglers soaking bait when suddenly, a wahoo greyhounded across the stern of the boat, leaving every soaked bait sliced surgically into two pieces with its razor-sharp teeth. Then, reversing its course, it returned to inhale the inert pieces of bait as they fluttered down to the bottom of the ocean. That scene will be etched in my memory forever. Since that time, on countless trips up and down Baja’s west coast and up into the Sea of Cortez, wahoo were never our primary target. Of course, we might sacrifice the short corner to a Marauder lure with a wire leader as we cruised by various high spots that might have some wahoo hanging around, and we would often be rewarded with fresh wahoo steaks for dinner, one of Yvonne’s favorites. By the late ’70s, we trailered our first WaterCloset, a 23-foot Blackman center-console skiff built by Don Blackman, down to Cabo San Lucas. Even then, wahoo were seldom at the top of our targeted species list. Though, recalling my experience on the Qualifier 85 years earlier, if one of our mono-rigged lures was bit off, we were sure to have one rig with a wire leader and a big hook at the ready to drop-back for the “toothy” wahoo, a maneuver that produced my father’s first-ever wahoo on one of our fishing trips together on the WaterCloset. In the late ’90s, we began the Baja on the Fly fly-fishing expeditions to Magdalena Bay to take advantage of the striped marlin pile ups often found offshore there in the late fall. Wahoo were still not high on our target list – not yet, anyway. Nonetheless, the setting of IGFA Wahoo World Records on fly tackle by Trey Combs, Ed Rice, and Terry and Wendy Gunn didn’t escape us. Once again, capitalizing on the knowledge gained on the Qualifier 85, we rigged one flyrod with one of the feather duster flies in a dark color and a wire leader for those seemingly occasionally-appearing wahoo! While we didn’t set any world records, the wahoo steaks added to the menu and were always a big hit with the clients and crew. More recently, anglers’ interest in wahoo here in Baja has evolved from incidental to targeted for many. This has influenced some tournament directors to include a wahoo division in their gamefish events. 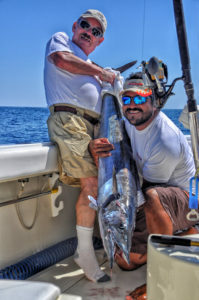 Continuing that theme, there are now several events that specifically target them, such as the “9th International Wahoo Tournament” La Playa, San José del Cabo, started by Tomas Cantor, Jr.. The 2017 event hosted 37 teams and produced 10 wahoo, with the largest weighing in at 49-pounds according to Eric Brictson, Gordo Banks Pangas. Brictson added that he also has several pangeros who successfully target the wahoo that frequent the surrounding waters. 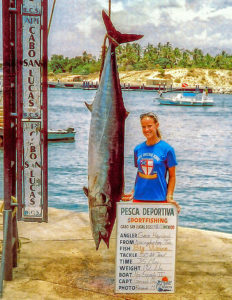 Another event was the “Cass Tour Wahoo Rumble” with 52 anglers producing only four wahoo, the largest weighing 28.5-pounds caught by Mary Kindschy, from Chicago. 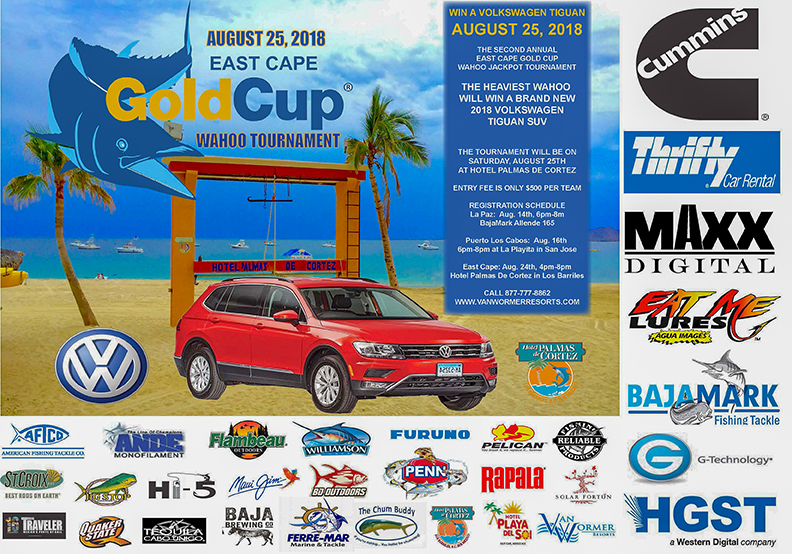 A recent newcomer to the Baja wahoo circuit in August was the “The East Cape Gold Cup,” attracting an impressive 44 teams of 147 anglers to the one-day event. 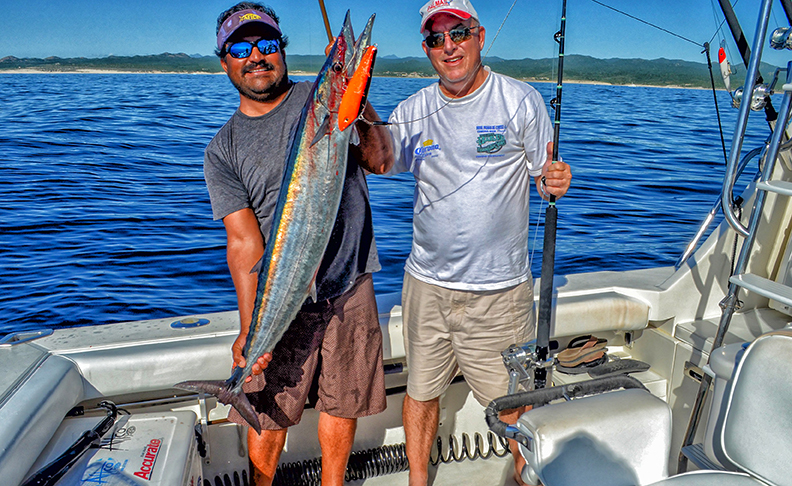 The Wahoo Jackpot Tournament, based at the Hotel Palmas de Cortez, featured wahoo, using a similarly proven format of their wildly popular “Dorado Shootout” held earlier in the summer. By the time the weigh station closed, teams brought 25 wahoo to the scales along with a yellowfin tuna and two dorado; according to Tournament Director Kit McNear, there were up to 50 fish lost with the largest weighing in at 55.5-pounds. At the end of the tournament, McNear and Eddie Dalmau from Baja’s Van Wormer Resorts distributed the jackpot money totaling $23,630 along with special items donated by the sponsors. Tales of not one, but two, of the largest wahoo ever caught since IGFA began keeping records were both taken in Baja Sur and are not going unnoticed. Sara Hayward’s 184-pound monster, caught in Cabo San Lucas in 2005, has remained the largest ever taken. 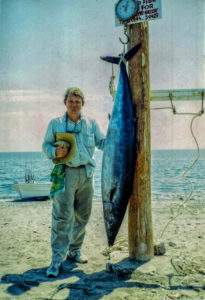 Her fish displaced Keith Winter’s massive 158-pound, 8-ounce wahoo caught while fishing off Loreto on June 10, 1996. Those fish, coupled with stories like Dr. Harvey Barish and his son aboard Barish’s boat fishing at Vinorama, who landed 11 wahoo the day after the Van Wormer Dorado Shoot Out held in mid-July 2013, have fueled demand for detailed information that can be exploited by eager anglers. With all the recent tournament activity, local anglers as well as visiting anglers have suddenly recognized that wahoo deserve more attention than they have previously been given. The demand for more information on how and where to catch wahoo has never been greater. 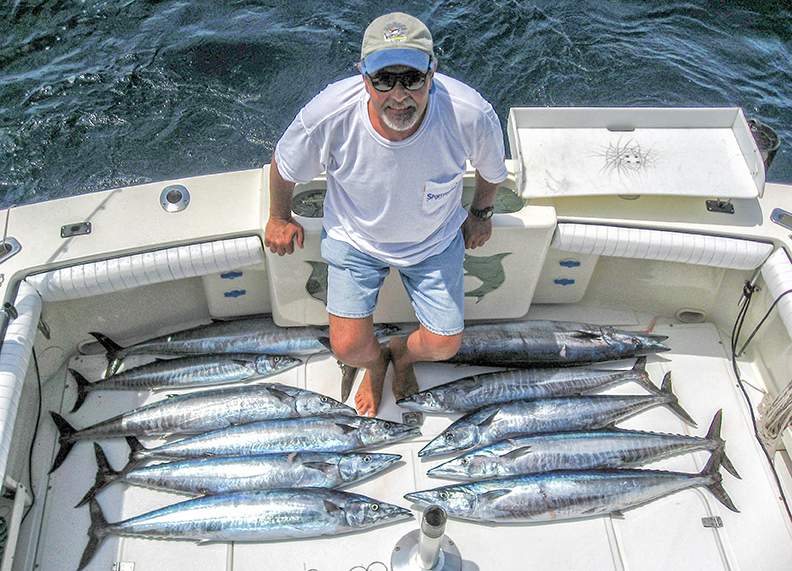 McNear, whose sportfishing career spans decades exploring Hawaii, Fiji, Panama, and the Caribbean in search of wahoo, graciously offered to give up some of his favorite East Cape spots along with some of his techniques that he developed the hard way, through trial and error. Plus, he prefers areas where bait is present near a hard drop off. North end drop-off at Cerralvo Island (Light fishing pressure, and fantastic wahoo fishing at times in the fall). Near school of smaller-size yellowfin. Sometimes near floating debris with holding bait. X Rap 30-40 Rapalas in Purple and Black 60- to 70-feet back. The newest Rapala X Rap 40 in black/purple will become the number one wahoo lure in Baja! Live bait or rigged ballyhoo fished off downrigger 30 to 40-feet down and 50-feet back. (If fish are touchy and will not bite lures, go to bait). Rigged with a trap hook rig with ballyhoo with a purple skirt on head of bait. 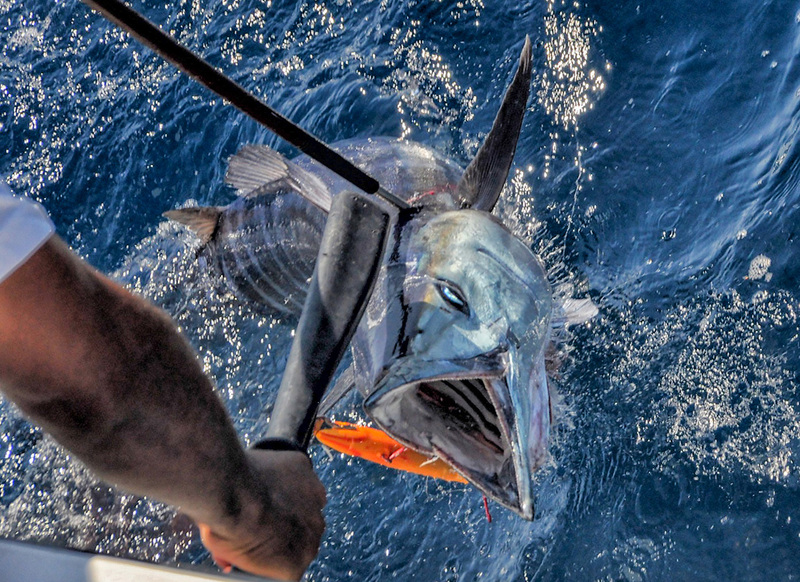 Armed with this additional information provided by McNear and other “Wahoo Whisperers,” will anglers be encouraged to pursue a new, worthy adversary, the wahoo? Will this fish, now at the tail-end of the alphabetic Baja species list, rise to nearer the top of the anglers’ target list, replacing the diminishing dorado? Only time will tell.